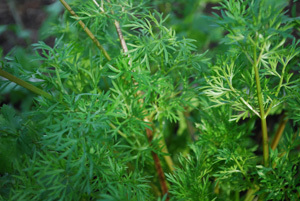 Harvesting cilantro is as easy as pinching off leaves to use as needed. Once the rosettes form, harvest leaves by pulling off individual stems near the base of the plant. It’s best to harvest a few larger leaves from several plants, so they all keep producing. On plants that have bolted, pinch or cut the leaves off where they join the stem. Strip the leaves from the stems for use as a garnish. If you’re harvesting cilantro in large amounts, you can preserve cilantro by freezing it in cubes. Grind the leaves and fine stems with a little water in a food processor to make a coarse paste. Press this paste into ice cube trays and freeze overnight. The next day, turn the cubes out into a bag or other container to keep in the freezer. Use individual cubes as needed in soups, curries, and anywhere you’d use fresh cilantro. Frozen cilantro cubes will keep for 3-4 months in the freezer. 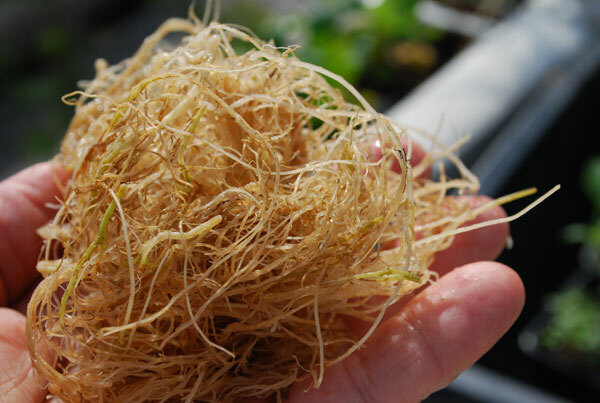 If you’re harvesting cilantro roots as well as the leaves, pull up whole plants and cut the main stem just above the roots. Strip the leaves, then knock as much dirt as you can off the roots. Trim the roots, discarding any large, fibrous roots. Place the finer roots in a bowl of water. Rub the roots between your fingers to get the remaining dirt out of them, remove the roots, and dump the water. Fill the bowl with clean water and repeat the process, then place the roots in small freezer bags, label and date them, and store them in the freezer door, where they’re easy to get to. 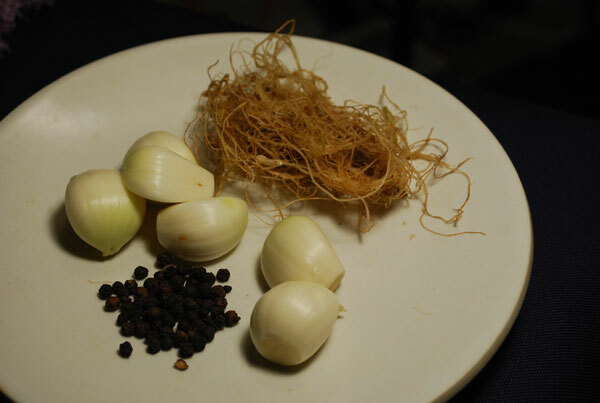 Fresh or frozen coriander roots make a delicious Thai chicken soup when pounded with garlic and fresh peppercorns. If you’re harvesting cilantro seeds (coriander), cut the seed clusters off the plant when the seeds are round, full, and turning brown, and drop them into a paper bag. Make sure you use a paper bag, not plastic, and that the seed heads are not wet when you put them in the bag, or they’ll mold. Place the paper bag on top of a cabinet and leave them to dry for 2-3 weeks. When the seeds are dry, slap the sides of the bag together between your hands, and roll the seed heads around between your hands; the seeds will fall to the bottom of the bag. Turn the contents of the bag out onto a sheet of newspaper, pick out the bits of stems and twiggy stuff, and transfer the seeds to a spice bottle or seed saving container. Smash the garlic, peppercorns, and coriander root in a mortar and pestle, or (better) blend in a food processor to a paste. Heat the oil in a large soup pot and sauté this paste for 4-5 minutes. Add chicken stock, shitake mushrooms, and chicken and bring to a low boil, then turn it down. Simmer for 15 minutes. Add the fish sauce, green onions, and cilantro. 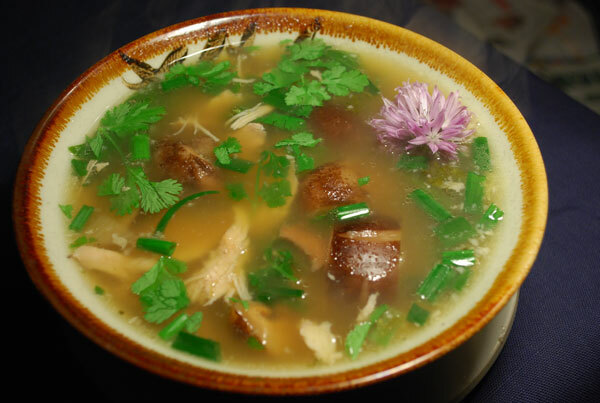 Ladle into bowls and garnish with additional chopped cilantro, and chive blossoms, if you have them.